The U.S. Chess Championship and U.S. Women’s Championship are the marquee events of American chess and for the last 11 years, the St. Louis Chess Club has been hosting both events at their illustrious club. This year’s edition has been the strongest championship in history, with a record five players over the 2700 rating threshold. The U.S. Women’s Championship has had a tale of its own, with an eclectic mix of new and experienced players setting the stage for what would become one of the most exciting national championships in history. The open section quickly saw the top-rated favorites build a significant edge over the field, with Hikaru Nakamura and Leinier Domínguez leading the charge. 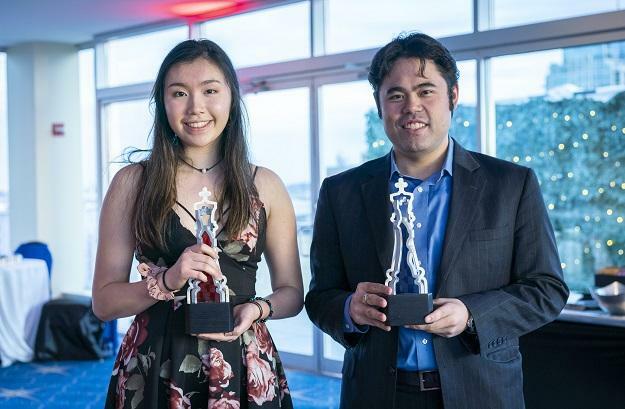 U.S. 2019 Chess Championship winners, Jennifer Yu and Hikaru Nakamura. Fabiano Caruana, the rating favorite and 2018 World Championship contender, struggled to make a statement in the early rounds and fell behind by as much as a full point at the tournament’s mid-point. As the tournament progressed, Caruana began to find his stride, and, with that, a string of victories followed. Going into the last round, there were three players tied at the top: Nakamura, Dominguez and Caruana. The four-time champion, Nakamura, was the only player to score a victory in the final round, as the other contenders drew their game. With that, Nakamura clinched his fifth national title. In the Women’s Championship, the 17-year-old Jennifer Yu completely stole the show from beginning to the end. She scored an incredible 10 points out of 11 total, dominating the field and padding her rating coffers with more than 100 points. Coming into the tournament, the rating favorites were the experienced Irina Krush (the only grandmaster in the tournament) and Anna Zatonskih. While Krush couldn’t find her form throughout the event, Zatonskih kept pace with Yu and went into their round-10 direct encounter trailing by only half a point. All eyes were on this game, as everything was on the line. On one hand, you had the four-time champion and experienced veteran Zatonskih; on the other hand, you had the exuberance of youth in the high school junior, Yu. Both women are fierce competitors, and the tension was high from the get-go. Yu surprised her opponent and played confidently, while Zatonskih seemed to not be fully aware of the position’s requirements. Yu’s pressure was too much for Zatonskih, who finally erred and allowed her young opponent to break through. Yu’s victory gave her the title with one round to spare, as all other competitors were too far behind in the standings. It was a career-defining moment for Yu, who has now officially confirmed her talent and opened new doors for further success. Congratulations to the 2019 U.S. Chess and U.S. Women’s champions, Hikaru Nakamura and Jennifer Yu. Cristian Chirila is a Romanian chess grandmaster. He is coach of the Mizzou Chess Team. It is that time of year again at the St. Louis Chess Club. The most coveted event in American chess is upon us: the 2019 U.S. Chess Championship and U.S. Women’s Chess Championship. Every year, the best chess players this nation has to offer gather in the capital of chess, St. Louis, to compete in one of the strongest national championships on the planet. With new talent joining the mix, this year’s edition is going to have the highest rating average in the event’s history. The St. Louis Chess Club played host to 10 of the finest female chess players in the world for the last couple of weeks. The brand-new event, the Cairns Cup, saw the participants face each other in a nine-round, all-play-all-format event for a whopping prize fund of $150,000. Commentary was broadcast on the internet featuring the familiar trio of Yasser Seirawan, Jennifer Shahade and Maurice Ashley. In addition, there were two other all-female commentary duos: Almira Skripchenko and Anastasiya Karlovich did Russian-language commentary for online audiences, while Tania Sachdev and Tatev Abrahamyan did on-site commentary at the Kingside Diner next to the Chess Club. Suffice it to say, this event was a big deal, and it was treated as such. The college chess scene is booming, and it is easy to see why. The inclusion of so many strong chess programs and the explosion of rivalries between universities that give scholarships based on chess naturally lay the groundwork for more and more tournaments to be added into the circuit. Traditionally, it is clear that the two most important events of the year for collegiate chess are the Pan-American Intercollegiate Chess Championships and the Final Four. However, there is plenty of room for growth, and last weekend, the inaugural U.S. Collegiate Rapid and Blitz Championships was held on St. Louis University's campus.